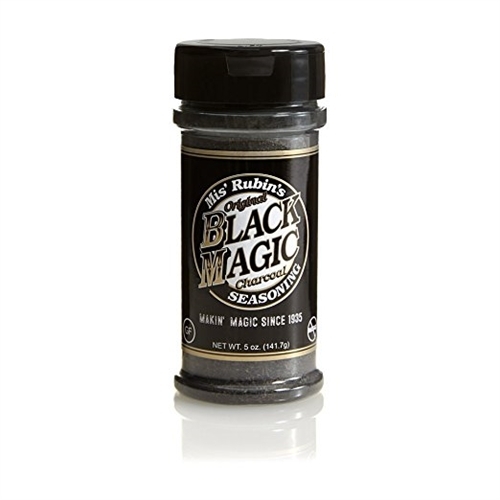 IMPOSSIBLE TO MISUSE: Whether you are cooking for one, preparing a week’s worth of meal prep, or hosting a giant party, Black Magic steak seasoning and BBQ rub will transform your meat. Feel confident smothering your meat in our blackened seasoning to enhance the flavor of the meat. We promise a savory balanced flavor that will not overpower your steak. You can’t go wrong using Black Magic. It even works great in cast iron cooking. GOURMET SPICES: This Alabama BBQ rub uses only the finest herbs, spices, special charcoal flavor and none of the bad stuff. Black Magic Charcoal BBQ Seasoning is Gluten Free, No MSG, Low Sodium Seasoning. Stock your kitchen pantry with wholesome goodness. MOUTH WATERING FLAVOR: This southern savory seasoning creates a beautiful mahogany bark on any meat. Best on the grill, Black Magic, magically transforms steaks, like Ribeyes, NY Strips, and Filets into a mouthwatering masterpiece. It’s also surprisingly versatile and is delicious on burgers, brisket, ribs, pulled pork, roasts, wild game and even hearty fish like tuna. A Black Magic steak can’t be beat!